Now, is the time to be drying and preserving our garden herbs. My herb plants are exploding with greenery that is full of zesty scent and oodles of flavor. Be sure to take advantage of this bounty fresh and to use in your winter meals. My rules, when drying herbs, is to preserve only what I am going to use and keep them in air tight containers, stored away from direct sunlight. I have found no reason to spend time & energy drying excess herbs when they’ll just end up getting composted. Maybe this year I’ll sell a bit of excess at the farm stand, but overall, I’ll only preserve as much as we will use in a year or so. Basil is my favorite herb. I absolutely love the aroma of fresh basil, so much so, I even add it to my flower arrangements. 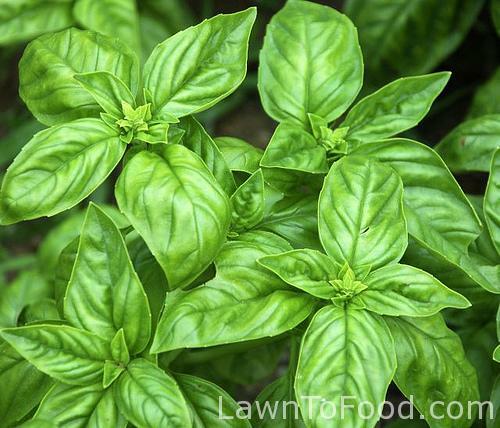 Basil is superb fresh on salads, especially tomatoes, and in pasta sauces. We use a lot of dried basil in our salad dressing -1 1/4 c. Olive Oil, 1/4 c. Ume Plum vinegar, 3 cloves of garlic & 2 tsp. dried basil. I dry my herbs in the dehydrator or during the hot months, hang them in bunches out of direct sunlight. Herbs can also be dried on a cookie sheet in the oven. For best results, set the oven on the lowest temperature possible. Oregano is one of my favorite dried spices. I add it to my homemade tomato sauces for a burst of flavor, mix it with other dried herbs for my own “Italian seasoning blend” (which when mixed with butter & olive oil makes exceptional garlic toast) and it is an important part of my dry rub for perfect baby back ribs. Parsley is used in many of our family dishes. It is easy to grow abundantly and tends to self-seed in our garden. I dry about a cup full each year and keep a couple of small baggies of freshly chopped parsley in the freezer. Chives are great in dips and salad dressings. They give food a good oniony kick without being too strong in flavour. I use a lot of fresh chives throughout the growing season and dry several cups for winter use. I love letting the chive plants flower. The pink pom-poms look great, as well as provide food for bees and pollinators. Cilantro is another easy to grow herb that self seeds around our garden. I use it in Asian noodle salads as well as in Mexican dishes. Cilantro is always added to my guacamole, and “mock-a-mole” when avocados are out of season, plus salsa and side dishes. I haven’t dried Cilantro, but this year I am going to collect its seeds and grind them into coriander. Dill is another abundant herb in our garden. I love it freshly chopped into new potato salad but the majority of our dill is used to pickle cucumbers. I also dry a small amount to add to dips, or sprinkle on boiled potatoes during the winter. Poultry Seasoning is a combination of herbs that I use mainly for bread stuffing. 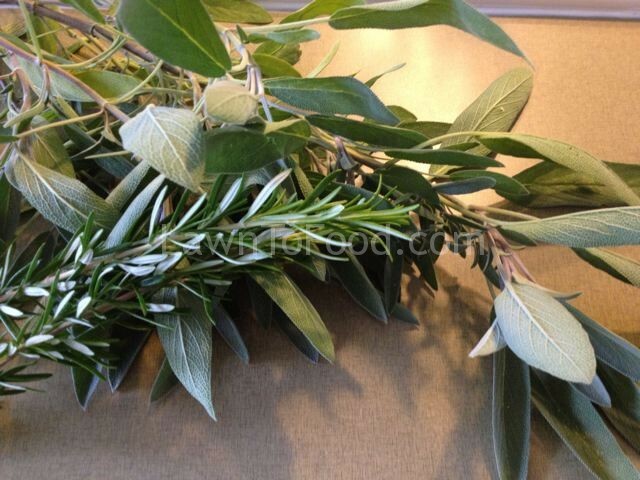 From our garden, I make an organic blend of dried Sage, Rosemary, Thyme and Marjoram. I also use these herbs fresh underneath a roasting chicken to make excellent gravy. Personally, I don’t drink a lot of mint tea but I do like to have some dried mint on hand. I use dried mint in some ethnic lamb dishes, in some desserts and as a soothing tea. For the first time this year, I am growing peppers to make Paprika. I am hoping to smoke some paprika peppers to use in southwest bbq sauce and dry some to add to the spice rack. I’ll let you know how it all turns out! This entry was posted in Fresh Vegetable Ideas, Growing Food, Let's Eat, Preserving & Using Preserves, Reep the Harvest and tagged basil, dehydrator, herbs, poultry seasoning, rosemary, sage, thyme by Lynda. Bookmark the permalink.